Northern Europe’s largest aquarium, home to thousands of animals and 7 million litres of water. The sea is full of mysteries and unknown animal and plant species. Every single day, our experts contribute with new knowledge. Whether you arrive by land, sea or air, you can’t miss the National Aquarium Denmark – Den Blå Planet. The National Aquarium Denmark – Den Blå Planet offers a unique experience, combining entertainment, fascination and knowledge in a spectacular setting. We are always professional when we work with fish and sea creatures and actively share our knowledge with others. The story of Denmark’s Aquarium and thus the National Aquarium Denmark – Den Blå Planet begins on Christmas Eve, 1934. The new Denmark’s Aquarium was built by the foundation Bygningsfonden Den Blå Planet. 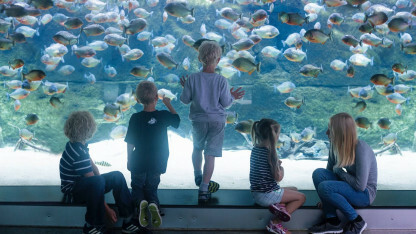 Do you have a question about the National Aquarium Denmark – Den Blå Planet? Find our contact information here. Read more about job opportunities at the National Aquarium Denmark – Den Blå Planet.